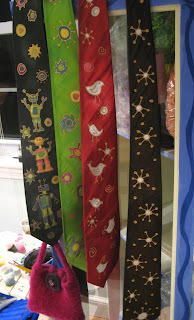 The Danforth Museum of Art has requested I make some ties for their museum store. I've had so much fun experimenting with color and design! I can't believe I haven't painted silk ties before. This is so much fun. The possibilities are endless. Let me know if you have any suggestions on tie designs and color.